Not yet played Space the game? Here is a quick view. Playtime runs about 1 hour for the basic game, and age ranges are 9-adult. Each player commands a fleet of ships that retain assets like you would find in a real space based battle. You have engines, weapons, shields, and shuttles. Pretty standard stuff. While the rules may seem a little different at first, most players pick up on the basics within a few minutes. 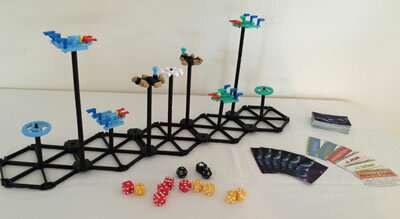 As you can see below all the play is done in midair suspended by the tiles and rods to place your ships at the desired vertical and horizontal position. I have included some rules that generate some very real emotions. Similar to the emotions that a fleet commander would experience. Some of these are the elation of victory and discouragement of defeat in battle. One of the first things you learn in STGv2 is that there is no place to hide in space. Fore details on how to play STGv2, the basic instructions may be found here. Right now we are offering prototype versions of the game for a range of prices and configurations. To purchase a prototype game you can follow this Order link.